This content will help educate readers on new Oracle ERP Cloud capabilities. What a fast innovation jump in this new year! This first month of 2018, Oracle had two major A.I. initiatives in the UAE that were top news across all media. Last conference, we crammed over 500 enthusiasts into the conference venue. And what a blast it was! 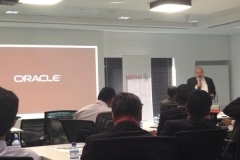 This year, we believe more attendees than ever are going to turn up for the Oracle users’ event of the year in Middle East. Don’t delay, register now for the full MEOUG MAJLIS 2018 Annual User Conference.